Canoe rentals are available at Sun Peaks for those with prior canoeing experience. Experience the nature that surrounds Sun Peaks as you maneuver your craft around McGillivray Lake which is only 6 km’s east of Sun Peaks. Experience the sport that runs through Hawaii’s beach history. Both a sport and a means of exercise, you will experience walking on water at the spectacular Heffley Lake. The newest craze to hit the resort, Sun Peaks is offering the adventure of Geo Caching.Set your GPS and search out the several Geo Caches located all over Sun Peaks resort, near Kamloops, BC. Before heading out on this fun self directed adventure, the Adventure Centre staff will provide you with an introduction to geocaching and explain the contents of your geocaching backpack. Each geocaching pack contains a hand held GPS unit, a map, pencil, and pad plus your instruction and information booklet. This is a fun activity for all ages. Embark on a one hour tour of Mt. Tod’s sub-alpine on horseback this summer. Pair this tour with a cowboy-style steak BBQ for the full experience: an 8oz Jack Daniels & Richards infused steak served with salad, asparagus, and potato. Spending time together is one of the best things you can do for your relationship! Enjoy a one hour romantic horse drawn carriage ride, a quiet dinner, and a bottle of sparkling cider for two. Our local lakes are home to resident osprey, bald eagles, loons, beaver, and thousands of trout. The lakes are also home to moose, bear, and even cougars all of which are frequently spotted. Through this completely non-strenuous trip guests will receive great insight into how this nation was explored, discovered, and eventually established. Tours depart daily at 10:30am and 4:30pm. Custom tour times are available and guests are encouraged to book this activity 24 hours in advance. Sun Peaks offers you the choice of either taking a guided tour or rent one of their inflatable kayaks and go off on your own and explore. This is definitely an opportunity to beat the heat and to get away from it all as you choose which lake you want to explore. Surrounded by natural foliage and panoramic mountain views, the challenging 18-hole par 72 Graham Cooke golf course is centered along the valley floor amongst the three surrounding mountains, Tod, Sundance, and Morrisey. The 6,400 yard course offers risk and reward opportunities intended to appeal to every level of golfer. Bonuses of the higher elevation is that your ball flies longer, plus, the higher mountain air provides for cooler summer days; Sun Peaks is often 10 degrees cooler than Kamloops, BC. With 1,200 feet of lift accessed vertical and 36 distinct trails ranging from flowing machine-made and world class DH tracks, to scenic All Mountain and expansive Cross Country, the Sun Peaks BC Bike Park offers something for everyone. A number of camps and clinics are offered to help you better explore our legendary Park, coached by experienced, local riders including Kona’s Dylan Sherrard and Specialized shredder Matt Miles. Open every day from June 26 to September 6 and then on Saturdays and Sundays from September 7 to September 26. 15 hiking trails and over 29Km’s awaits you at Sun Peaks. Experience hiking in British Columbia at its best! 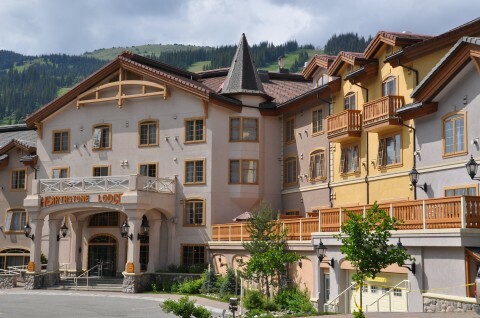 Start your mountain adventure right from your Sun Peaks hotel, or enjoy a relaxing ride up the Sunburst Chairlist and start from 6,000′ high above the Shuswap Highlands below. Explore our mountain playground with 16 hiking trails that range from relaxing strolls to exhilarating summits. During Alpine Blossom Season, mid-July to mid-August, take in the vibrant blooms of Indian Paintbrush, Tiger Lilies, Fireweed, and more. Check out the detailed Sun Peaks Flora & Fauna guide to anticipate what you can expect to see. Open daily from June 26 through to September 6 and then open weekends only from September 7 through to September 26. If you are planning on exploring Sun Peaks why not also take in the Alpine Blossom Season which begins the second weekend of July. Wells Gray Park B.C. is located 125 kms from Kamloops, BC and is near Clearwater British Columbia. It is a vast wilderness of 1.4 million acres (540,000 hectares). Lush flower meadows, beautiful peaks, pristine lakes, untamed rivers and incredible wildlife make Wells Gray Park one of the premier wilderness destinations in Canada. Wells Gray Adventures offers affordable, low impact adventures in the wilderness of Wells Gray Park. AAn abundance of bird, wildlife and wildflowers can be found in Sun Peaks Resort, British Columbia. Pack your camera and binoculars before you make your trek out for the day. Book some time with a professional resident Photographer for the optimal experience and to create exceptional photos of your stay.